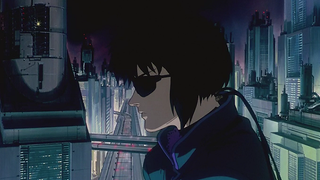 When adapting the Ghost in the Shell manga into an anime film, director Mamoru Oshii chose to turn the real-life streets of Hong Kong into a hyper-stylized, dreamlike city of the future. What's astonishing is that Oshii captured the real Hong Kong so well in his submerged metropolis. Ghost in the Shell does not have a definite chosen set, but in terms of street scenes and general atmosphere, it is obvious that Hong Kong is the model. Such a choice has, of course, something to do with the theme: on the streets there flows an excess or a flood of information, along with everything this excess brings out. The modern city is swamped with billboards, neon lights and symbols…. As people live in this information deluge, the streets will have to be depicted accordingly as being flooded…. There is a sharp contrast between old streets and new ones on which skyscrapers are built. My feeling is that these two, originally very different, are now in a situation where one is invading the other. Maybe it is the tension or pressure that is brought about by so-called modernization! It's a situation in which two entities are kept in a strange neighboring relationship. Perhaps it is what the future is.